Have you ever gotten so bogged down in the details that you never actually accomplish anything? I know I have. I almost didn't start this site a few years ago because it seemed overwhelming. Hundreds of thousands of lives would not have been touched if I had continued to obsess over the details and not taken the first step. If there is anything I have learned, it is that YOU MUST TAKE THE FIRST STEP if you are going to accomplish anything. That leads me to your challenge for today. WANT TO ACHIEVE YOUR DREAMS? 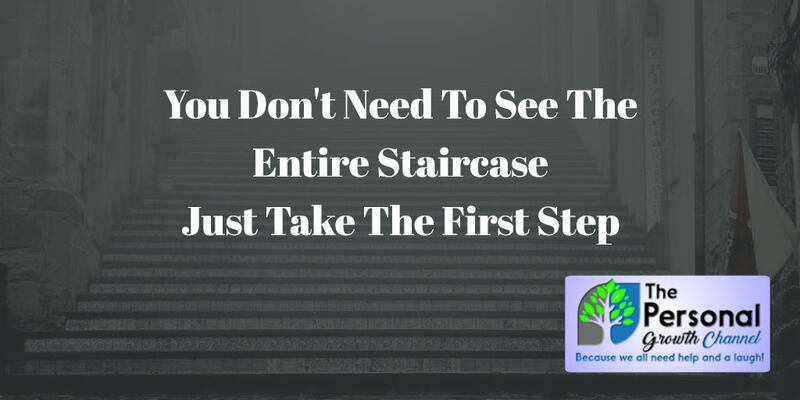 TAKE THE FIRST STEP! Want to share your ideas online or start an online business? Take the first step by creating an account with Bluehost. Then take some courses on Entrepreneurship while you are setting up your online presence. You may also want to take a course on using WordPress or just have someone build a website for you. Want to improve your health or lose weight? Take the first step by signing up for a consultation with a personal trainer or go through our weight loss program. If you aren't already exercising and eating right, start logging your diet with myfitnesspal.com and doing something active each day while you're learning more. Want to be effective when you ask for a raise with your employer? Take the first step by learning how to effectively negotiate your salary. Want to get out of debt or stop worrying so much about money? Take the first step by taking Dave Ramsey's Financial Peace University or Adam Hagerman's Budgeting for Budget Hater's Course. Sign up for YNAB if you aren't already using budgeting software and use the courses I mentioned earlier to learn more about best practices for getting out of debt in a timely manner. Take the first step by reading ScreamFree Marriage. Go back to the basics in the meantime while you're learning more, and give your spouse the type of attention you did when you were dating. Want to improve your relationship with your kids? Take the first step by reading ScreamFree Parenting. If you are in a step family relationship which is a little more challenging, you may also want to read The Smart Stepdad or The Smart Stepmom. While you are learning more, look for ways to compliment them on what they are doing right and sit down and really try to listen to what they have to say especially once they get into preteen and teen years. Ask very specific questions like what was the best part about your day rather than how was your day if you want more than a "ok" grunt. Take the first step by taking Kain Ramsay's life coach certification program. You'll also want to get a website started by creating an account with Bluehost. Want to build an app for your phone? Take the first step by taking an app development course. Want to build a game? Take the first step by taking a game development course. Want to be challenged to improve your finances, relationships, business skills, and health this next year with a book recommendation each month? Take the first step by joining our personal development book club. Want to network with others interested in personal development who have a growth mindset? Take the first step by joining our community. Want to learn practically anything? Take the first step by enrolling in one of over 45,000 courses at Udemy. If you want to achieve your dreams, TAKE THE FIRST STEP!! !